This is a sacred pre-historic temple in Manthoddam situated in Mannar District about seven miles north of Mannar town in Sri Lamka. It is famous according to legends as the kovil where Ketu Bhagavan worshipped Siva or Lord Eeswaram. Hence this holy shrine acquired the name of Tiruketeeswaram. It is one of the 275 Paadal Petra Sthalams. The temple is known to have existed well before 600 BC – over 2400 years! It is associated with the ancient port of entry called Mantotai and may have been built or maintained by merchants from South India. 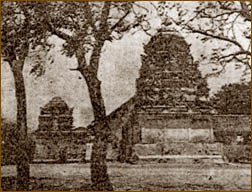 The temple was destroyed in 1503 by the Portuguese Catholic colonists, and rebuilt in 1903 by Arumuka Navalar. It is said that Mandothari, the wife of Ravana, was from Manthai and that Mayan, the father of Mandothari and the King of Manthai built the ancient Temple of Thiruketheeswaram to worship Shiva.